Our brand new shelter! Under construction – as of September 2017. Thank you donors!!! ARRF was founded in 2001 by Ann Fratesi who serves as its current director. The local animal shelter in Leland, MS, had no policies or procedures in place to assist or aid any homeless dog brought into the shelter by the local animal control officer. Dogs were usually put to sleep by shooting—yes, gunfire—within a few days if not hours of their arrival at the shelter. Ann confronted the City Council about this atrocity and was offered control of the shelter if “she thought she could do better”. And better she did. 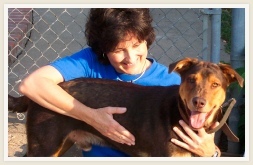 Although the shelter remains the substandard holding facility for dogs that is was in 2001, Ann has taken a shelter that was euthanizing by shooting 99% of its dogs to now adopting over 98% of its dogs to compatible, loving families. ARRF is providing necessary spay/neuter procedures to these dogs as well as vaccinations, rabies, worming and flea medication, and the critical treatment for heartworms that plagues our region. In spite of minimal funding and even the use of personal expenses, any dog that can be saved will be saved and placed in a loving home. For the last 2 years, we received in excess of 300 dogs and puppies. The only animals that are euthanized are either too sick to save or too aggressive to responsibly place in a home. In 2016, we successfully placed 313 dogs/puppies and lost 2 dogs to extreme illness. ARRF has adopted dogs into loving forever homes in 38 states. We adopt locally and we work through other rescue agencies in the northeast to place as many healthy, happy dogs as we can in loving homes. How Can YOU Help Us Save Precious Lives?